100 Per Cent Design With London Fashion Week now, oh so last week, designers of a different sort are gathering at Earls Court, London for 100 Per Cent Design, the annual contemporary interiors and architectural event. Here, established designers and manufacturers rub shoulders with er, less well established designers and innovators, to show off what could be coming to a dream home or office near you. We couldn’t resist a glimpse into tomorrow’s world and even found the latest in executive ‘digital’ toys. Nik Ramage’s Fingers were catching everybody’s eye and ear. As you’ll hear on the video, those mechanicals do make a bit of a squeak. 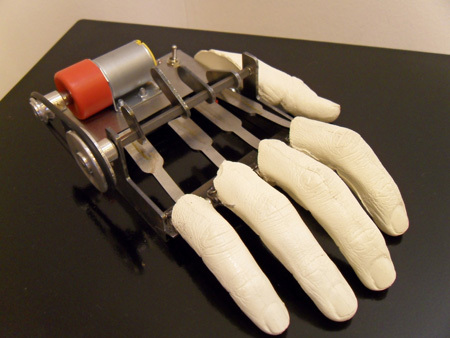 Naturally, it’s the artist’s own hand modelling those digits, so this a life-sized resin cast that is a must-have for every bored, board room. 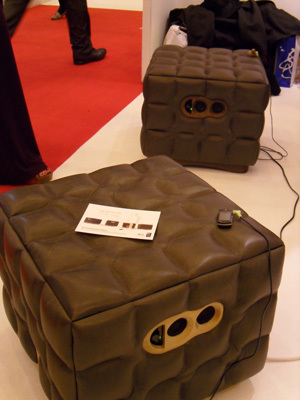 Called Music Chocolate this compact wood and leather pouffe takes the idea of creating hi-tech furniture, as it features a built-in amplifier and speakers and can be hooked up to an MP3 player. Applying ideas of movement to form and function, award winning fledgeling designer Il-Gu, Cha demonstrates two radio ideas. 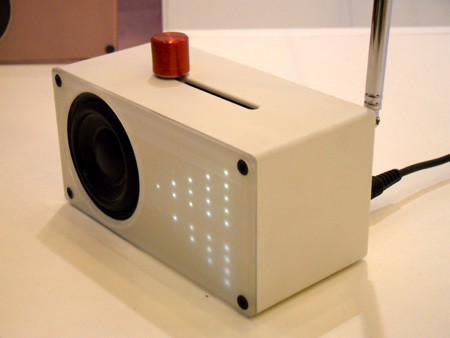 With R1, wheels on the bottom vary sound in one axis and tuning in the other. 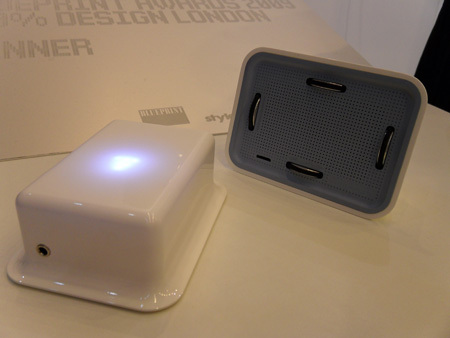 With R2 the idea is associating the slider’s position with the speaker and display. Over on the left, next to the speaker it controls the volume, move it to the display side on right and the same knob alters the tuning.